Dell and VMware partner to deliver integrated virtual server and virtual storage solutions through VMware® vStorage application programming interfaces (APIs). With vStorage APIs, storage area network (SAN) resources can be utilized for greater virtual server performance and more efficient management of the entire virtualized data center. 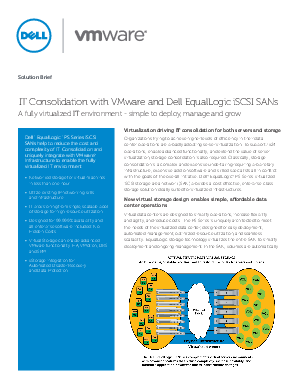 Integrated solutions available today from Dell include Auto-Snapshot Manager/VMware Edition (ASM/VE), an automated data protection tool for virtual machines, and Auto-Replication integration with VMware vCenterT Site Recovery Manager.